NGC 7331 is a spiral galaxy of some 100,000 light-years across, located about 49 million light-years away from Earth in the northern constellation of Pegasus (the Winged Horse), while it is receding from us at roughly 816 kilometers per second. It is the brightest member of the NGC 7331 Group of galaxies (also called the Deer Lick Group). It exposes a fine spiral structure despite its small inclination from the edge-on position. Light from older, cooler stars dominates the central bulge of NGC 7331, while the spiral arms show many star-forming regions along with dark dust lanes. In its center lies a supermassive black hole with about the same size as the one at our own Milky Way’s core, which is estimated to be 4.1 million solar masses. A curious ring of molecular gas coupled with newly formed stars extends outward some 20,000 light-years from NGC 7331’s core. The ring is not visible in optical images but is strongly apparent at infrared wavelengths which show the myriad of young stars. The huge reservoir of gas and dust associated with the ring-like structure contains the raw materials to produce another 4 billion suns. However, gas appears to be depleted inside the molecular ring. One possibility is that the gas was channeled into an accretion disk feeding the immense black hole at the galaxy’s center. Alternatively the gas may have been consumed during a period of very active star formation in the nuclear region of the galaxy. Another peculiar feature of NGC 7331 is a counter-rotating inner stellar disk component with a radius of 1,300 to 5,000 light-years. To make matters more complicated the galaxy possesses a decoupled inner disk-bulge component within the central 650 light-years where ionized gas is rotating faster than the rest of the surrounding central bulge. The stellar population of the circumnuclear stellar-gaseous disk is also relatively young compared to the normal older bulge population with stars that are about 2 billion years old. The most likely scenario accounting for the retrograde disk component and the decoupled gas is a large scale merger in the remote past where the aberrantly rotating system is genetically related to the merged galaxy. Until recently, SN 1959D, a Type II supernova that became as bright as 13.4 magnitude, was the only supernova that had been identified within NGC 7331. However, on April 21, 2013 the Type II supernova SN 2013bu was discovered in this galaxy. The other brighter galaxies around NGC 7331 are roughly 10 times more distant. 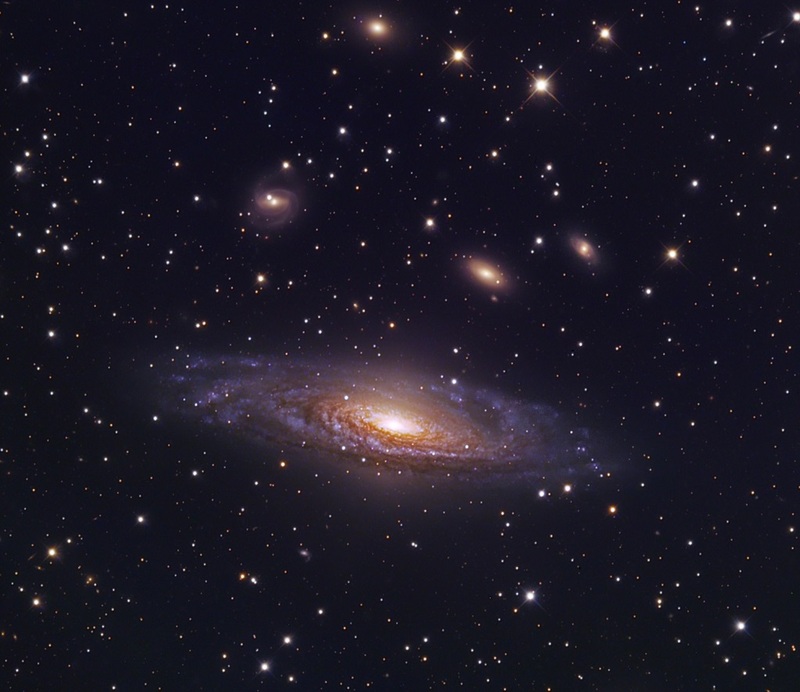 Their strikingly close alignment on the sky with NGC 7331 occurs just by chance.